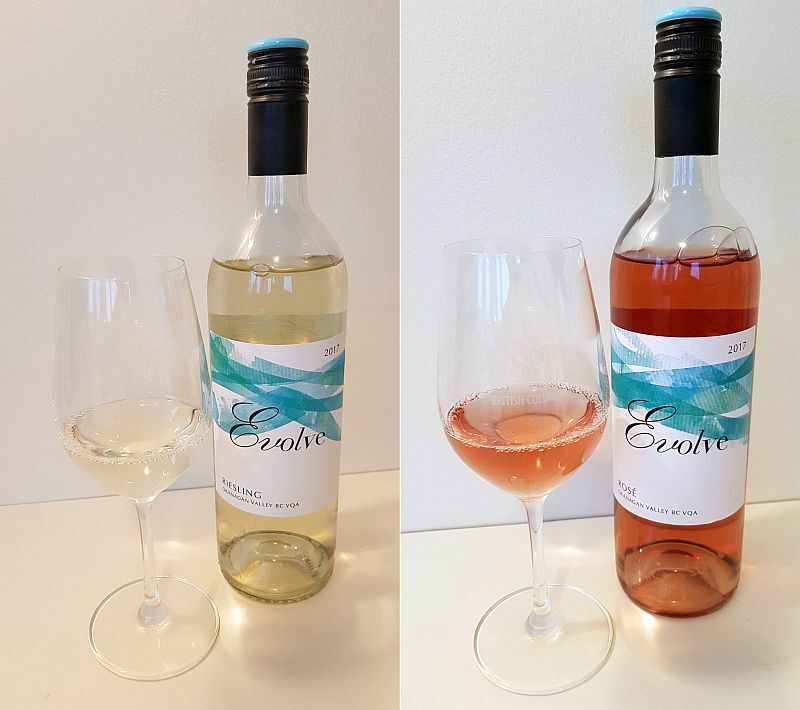 I have tried and written about the wines of Evolve Cellars, located in Summerland, BC, for a few years now. But it was this latest shipment of wine I received from them that made me think that there has been a significant change in some of their wines. Most people don’t think of sparkling wines too much other than it’s fun to drink and celebrate with friends and family. While I do the enjoyment aspect, I do pay attention to the wines I drink and write about. The two sparkling wines I received from Evolve Cellars, made me stop and notice them, as they were a step above in their taste and mouthfeel. I’ll elaborate more on these sparkling wines first, and then the other wines that I received from Evolve Cellars. Enjoy. 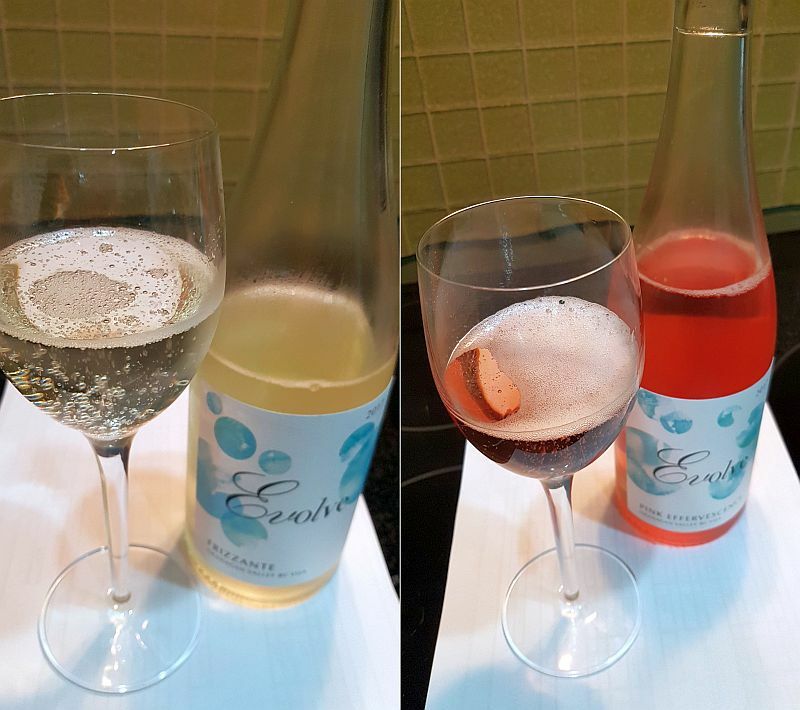 Evolve Cellars Pink Effervescence 2017 ($19.99) – Pale wild rose colour with lots of tiny bubbles on the surface of the wine. Medium body with lots of strawberries and to a lesser amount sweet cherry flavour. The wine is dry with high acidity, bigger body and flavour intensity. When you sip this wine it fills your mouth with small, very creamy bubble. It is almost the bubbles and texture of this wine you think about more than the flavour. The wine has a medium length finishing mostly with strawberries, but also some red cherries and leafiness. Very tasty. Rating: A real mouth-filling, creamy bubble from this dry sparkling wine, complemented by strawberry aromas and flavours. Evolve Cellars Frizzante 2017 ($19.99) – Medium straw colour with lots of tiny bubble in the glass. Light intensity aromas of lemon-lime, with a hint of peach. This wine is slightly off-dry and has medium plus acidity, body and flavour intensity. Again, lots of tiny, creamy bubbles in this wine. I think these bubbles are slightly finer and more elegant than the Pink Effervescence. Citrus and crisp apple flavours primarily with lesser amounts of peach and apricots. Medium length finishing with citrus and some minerality. Delicious. Rating: – An elegant off-dry sparkling with lots of tiny creamy bubbles. lemon-lime on the nose, with citrus and crisp apple on the palate. Evolve Cellars Rosé 2017 ($16.99) – Medium orangey tea rose petals colour. Medium minus intensity nose, showing off sweet red fruits, light vanilla and bramble leaf. I enjoyed the aromas of this wine. With decanting I picked up on rhubarb aroma, and it also showed up on the palate. The wine is slightly off-dry, medium bodied. It is silky smooth thanks to the lower acidity. Red fruits and strawberry flavours with a bit of bitterness toward the finish. I mentioned rhubarb flavour showed up with decanting, as well as cranberries. You may say it has a bit of rhubarb strawberry jam flavour to it. The wine has a medium length and finishes with red fruit flavours. Decanting recommended. Rating: – A soft rosé with red fruit aromas and flavours, and if you decant it some rhubarb and cranberries as well. Evolve Cellars Riesling 2017 ($18.99) – A paler lemon colour with a tinge of green. It has a light nose that grows in intensity with some air. Aromas at first of lees, citrus, lime and a lesser amount of peach. The lees aroma does burn off quite quickly in your glass. The wine is between off-dry and medium-dry. Medium plus acidity, body and flavour intensity. You get a light acidic prickle on your tongue. Flavours of lime, tart and sweet green fruit, sweet citrus, and a touch of peach. The wine has a rounder mouthfeel due to the higher sugar content. Medium plus length finishing with mouth-watering acidity. Rating: – A blend of sweet and tart citrus flavours. A bit sweeter with a light acidic prickle. 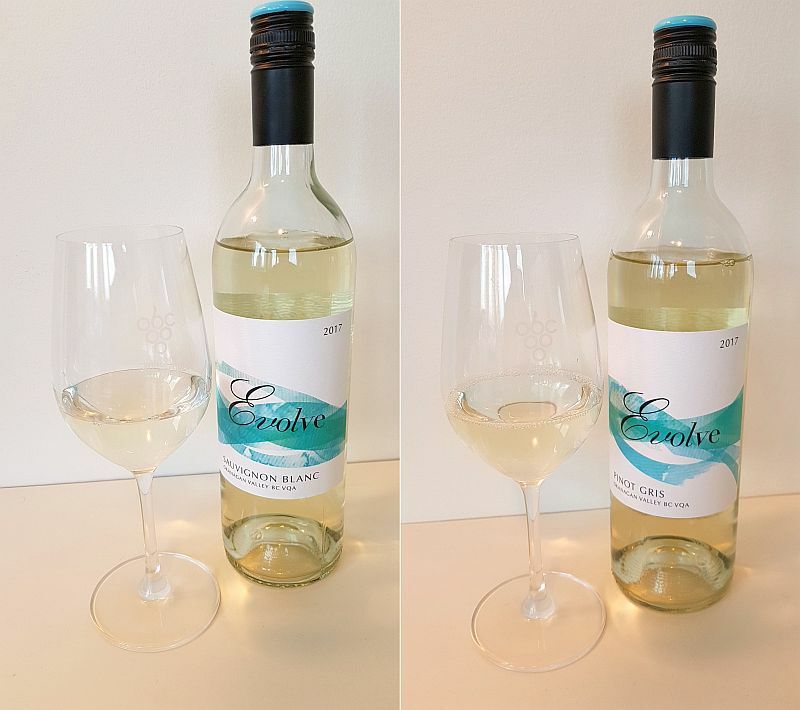 Evolve Cellars Pinot Gris 2017 ($16.99) – This wine has a medium intensity, bright lemon colour. A nice medium intensity nose, showing melon, white flowers, peaches, and other summer fruit, along with a hint of orange in the background. The wine is a little off-dry, round, with a thicker mouthfeel. It does have higher acidity and gives you a light acidic prickle on the tongue. Juicy stone fruit flavours, red apples, peach, and touches of tropical fruit and mandarin orange. With decanting the wine was not as aromatic, but I did get some additional green fruit flavours. I like the crisp acidity as it is not overdone giving you a puckering mouth. Finishes with tasty stone fruits, citrus and citrus rind. I prefer the undecanted version but both are good. I had friends try this wine, they really liked it, and took photos of the label so that they could buy this wine for themselves. Rating: A nice nose, mixing floral, stone fruits and orange. More juicy stone fruit on the palate along with red apples and peaches. Evolve Cellars Sauvignon Blanc 2017 ($16.99) – Pale bright straw coloured. Medium plus intensity aromas of sweet ripe green and tropical fruits, sweet / candied grapefruit, with touches of stone fruit and jalapeno pepper. It is off-dry, round with light acidity. Green fruit flavours, pear, citrus and a hint of peach. With decanting, you also get some lime on the palate. The wine has a medium length, finishing with light fruit and leafiness. Rating: This is an easy sipper. Not too tart. Off-dry, green and citrus fruit. Where Can I Buy These Wines? All these wines are under $20 and I think a good value for BC wines. You can purchase Evolve Cellars wines through this link. The wines are also available at many retailers. The list of retailers is at this link.